I’m back! I was hoping that my first post after my vacation in Guatemala would be inspired by some awesome dish I had while traveling, but I soon found out that the food there was nothing really to write home about. Even though I totally fell in love with the country and had an amazing time, I know now no one goes there for the food! So I was really eager to get back into my regular but yummy poor vegan diet. I know most of my posts have tempeh, but it’s pretty much a staple in my diet, and I love it, so I’m always trying to find new things to do with it and different ways to season it. And one of my other favorite things is mustard, so this is a n0-brainer. 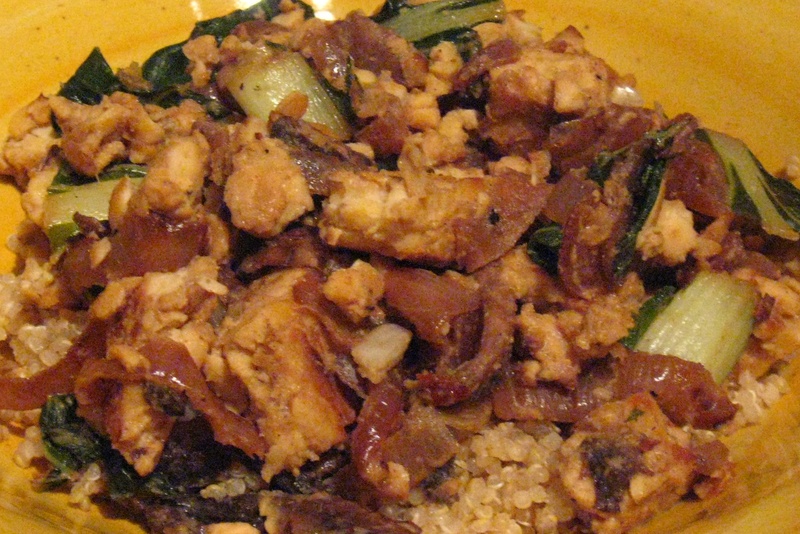 Tempeh soaks up any flavor really well so you can do anything with it! 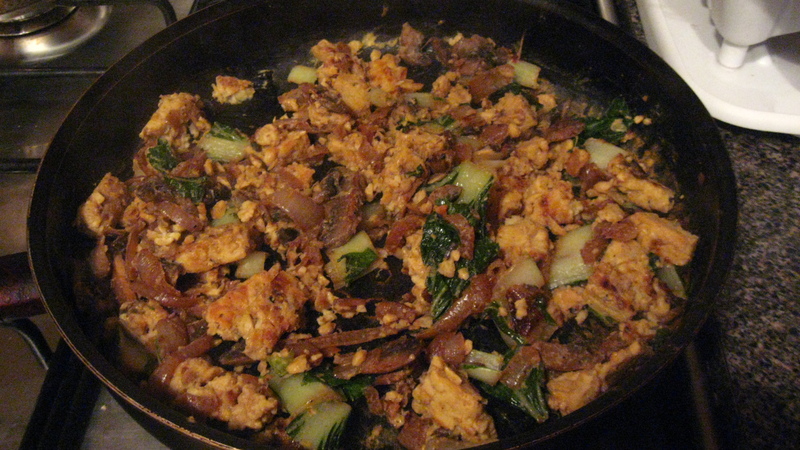 This is adapted from a Delicious TV recipe I made a while back and absolutely love. To make the marinade, in mixing bowl, whisk white wine, water, mustard, and garlic together. In a nonstick pan, spray coat of olive oil. Add onion and salt and caramelize over med-low heat, covered, until it starts to brown, stirring so it doesn’t burn (about 5-7 minutes). Add red wine to deglaze the pan and cook 3 more minutes. Add mushrooms and cook another 3-5 minutes until they’re soft. 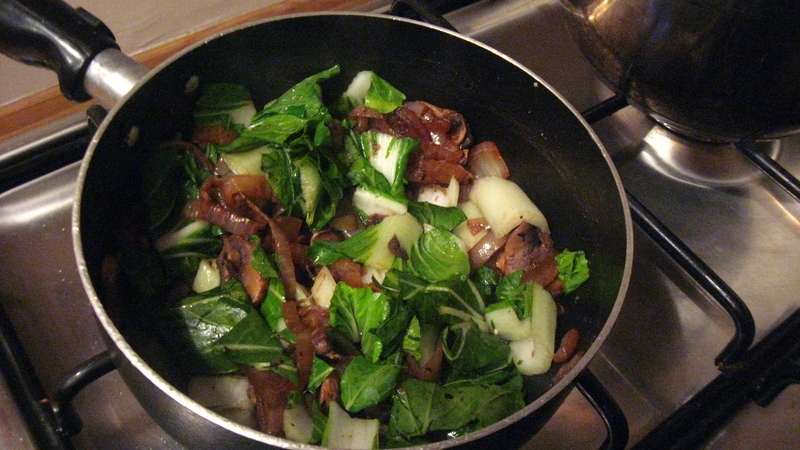 Add chili paste and bok choy and cook another 3-minutes, adding water if it becomes too dry. 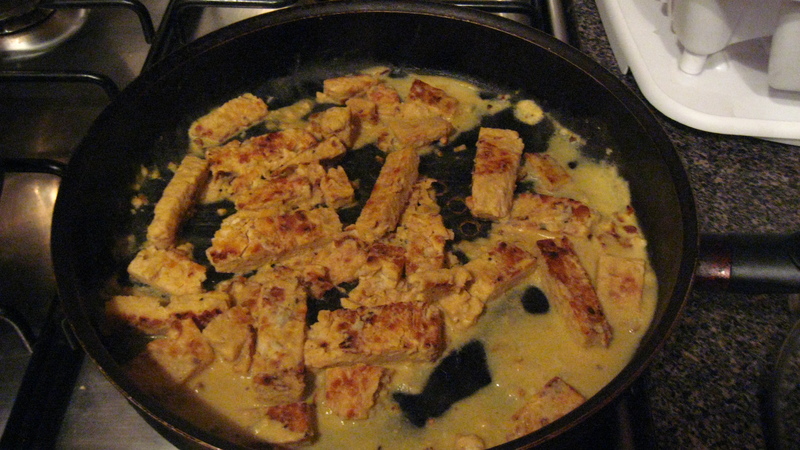 While the vegetables are cooking, spray coat of olive oil in another pan and brown tempeh strips on both sides (until golden). Add marinade, cover and let simmer until it starts to evaporate, spooning some of liquid over tempeh occasionally (about 5 min). Be careful not to let all the liquid evaporate so you still have some left over for the vegetables. Add the veggies to the tempeh and mix everything together over low heat for a couple more minutes until the rest of the marinade cooks down.